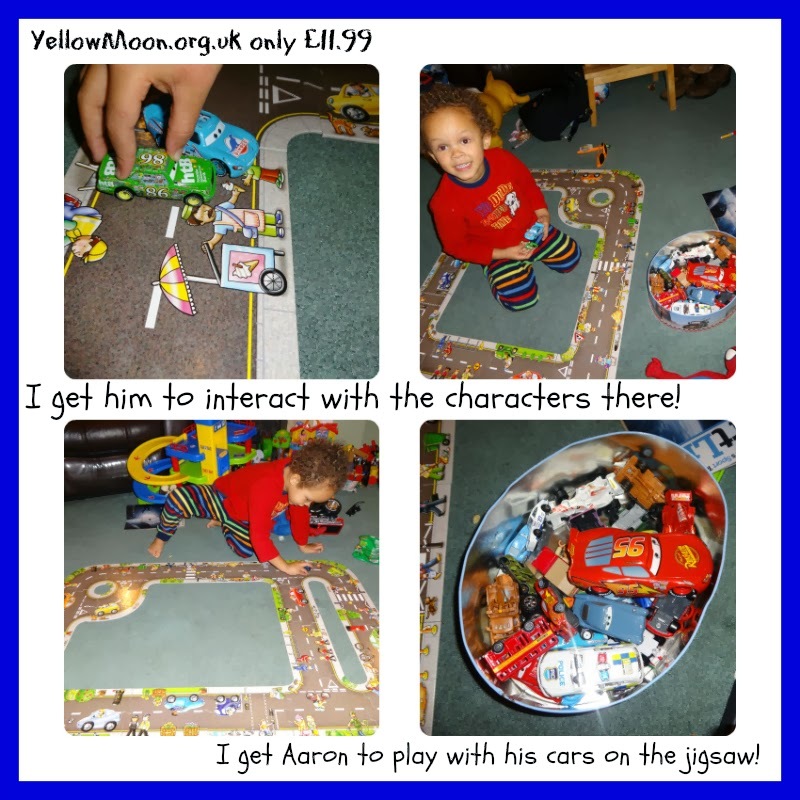 We were given the opportunity to review some toys from Yellow Moon. When I told my friend she said "but they just do crafty stuff!" Nope, they have loads of GREAT educational toys AND they are cheap! It was a real eye-opener for me. At the end of the Summer, I was in Hampstead and ended up in a posh yummy mummy shop and bought the Orchard Toys Shopping List game for £7.99 (I now discover Yellow Moon sells it for £5.99!!!). Apparently it is Orchard Toys' best seller, and deservedly so. We've played it every day since, and it even helps keep Aaron occupied when I take the washing to be dried ((i) I detest airers round the house (ii) we don't have space for a tumble dryer (iii) the ones when we go out can fit 4 loads!). Aaron can now recognise and name shopping items he had not heard of before. He remembers them, from game to game. So that's increased his vocabulary. Trying to place the shopping neatly, on the trolley has improved the accuracy of his dexterity and hand to eye coordination. It's made him a good loser the occassional time he loses. It's made him patient; he sits and waits for his turn. He's honest - I tried to lose on purpose today, because he does like winning and my vigilant observant boy noticed. It's a great game to play with visitors. The box says "Orchard Toys encourage children to communicate, share and play together" - it's so very true! Thanks to Yellow Moon, we are now the proud owner of more Orchard Toys and they are incredibly educational and fun - for parent and child! I literally love them and I can't stress enough, those are my own words! Thanks to this review, we now love the Monster Catcher game as much as the Shopping List one, and it is fabulous for play dates, like this one featured in these photos with my friend and her son. Her son hasn't been playing with it for weeks like us, but he got the concept straight away, and found it interesting enough to stay in one place also. I must admit, with the Shopping List game Aaron and I "got it" immediately, but with the Monster Catcher game, it took a few plays for me to realise that play is meant to end, when you make the "scene" that I have photographed here. So each time a player takes a card, they are either (1) acquiring feet (you start with two each and add more) or (2) getting heads to go with existing feet or (3) getting heads that have no feet so they go on the "discard" pile face up or (4) getting a monster catcher net to fill or (5) one to empty and free said monsters. I was so caught up in THAT process I did not realise that if you get one of the 6 pieces of the scene, you put it in the centre and once that "scene" is complete, the game is over, so effectively it is acting like a egg timer. Once the scene is complete, the player with the most monsters wins. The first couple of plays it was just Aaron and I and we did not enjoy it, and we remained loyal to our Shopping List game but THEN my nieces and nephew came round for Halloween and BOOM, have you seen the way a game changes when it is played with 4 players. I suddenly got it, and enjoyed it, so much we played it many times. To give you an insight, their ages are 5, 9 and 12, with Aaron of course age 3. They ALL enjoyed it. So if you are spending Christmas in a house with lots of children of various ages, I would highly recommend it. It is quite competitive and incredibly fun. What is beautiful to watch, is that it has taught Aaron at the age of 3, to lose gracefully. That is a lesson I think every true gent needs to learn and I am so proud of my boy learning that at the tender age of 3! Thank you Yellow Moon and thank you Orchard Toys! It is £5.99 at Yellow Moon and the great thing about them is "When you buy this product £0.25 cash-back will go to your nominated school, group or charity". Great huh? You'll find out for yourself but keep THAT price in mind as it is the cheapest I have seen from a brief scour (more than once) of Google. There are so so so many different configurations of the road that you can do! Come back later and I will also tell you about the Tell The Time Book and the Gruffalo Jigsaw but right now I need to catch my little monster from nursery!!! Okay the Tell The Time (wipeclean book) is something Aaron has been FASCINATED with since it arrived! He gets me and Daddy every spare moment to go through it with him. Fast learner though, as when I showed him various times, he couldn't understand why he couldn't see both hands when it was 12 o'clock - bless him! It's only £4.99 and worth EVERY penny! If you are buying gifts for a niece or nephew who is approx age 3 or even slightly under, if you think they have too many fun toys, why not think about getting them some educational ones - their Mum will love you for it, as the fun you get out of them is awesomesauce! It's definitely causing us to learn through play! Finally the Gruffalo jigsaw. There's not much I can say about it, as it is the item we have played with the least. We love it and everything - the Gruffalo (and previously We're Going on a Bear Hunt) are our favourite books, but a jigsaw is a jigsaw is a jigsaw right! BUT having said that, EVERY guest we've had for a play date recently, and trust me, we've had quite a few, have all wanted to do it at least once and it is large/fun to build. I always start with the borders and fill in the middle after - a technique I am TRYING to teach Aaron. It's £6.99 and probably the least value for money item out of the 4 we were sent. I'd highly recommend your checking out Yellow Moon. You'll save pounds not pence if you compare prices. If you are a Mum reading this, with a younger child than Aaron, I can advise that educational toys are the next stage, and oh so worth it! Disclosure: we were sent all 4 items to review. As I clearly stated our adventure into Orchard Toys (not Yellow Moon) began with my PURCHASE of their best seller: The Shopping List game. We absolutely LOVE that AND The Monster Catcher.